October 9: Surprise! We’re moving our annual Halloween party indoors. Join us 6-8 PM at the old Franklin Junior HS, 48th & Franklin, for a fun evening. Wear your Halloween costumes. Treats, games, and laughs. October 6: Not a very nice day, but we are playing! Avoid Martin Luther King Parkway at Fleur–closed due to the ALS Walk this morning. OK to use 9th St viaduct through downtown. MLK probably ok from the east. OCTOBER 1: Mother Nature is raining on our parade. NOTICE–We are CANCELLING tonight’s annual Police & Fire games. SEPTEMBER 29: Mother Nature is raining on our parade and our birthday. We’re cancelling the 2, 3, and 4 PM games. See you all Monday night for Police & Fire ALL STAR Games. SEPTEMBER 22: It’s a great day for baseball–crisp, cool, sunny, no wind. Come on down to watch your favorite team. We might even sell some hot chocolate today! It’s the Twins vs the White Sox at 9 AM with Wells Fargo Retail Services as our buddies. SEPTEMBER 18: Our Annual DM Police & Fire Night ALL STAR games at POSTPONED until Monday, October 1, due to the bad weather. SEPTEMBER 15: Avoid going through downtown in the morning–it’s the usual FARMERS MARKET all morning. AND avoid the Western Gateway Park all day where the World Food Festival is happening all weekend. SEPTEMBER 1: 9 & 10 AM games ARE CANCELLED due to rain. Fall Season began August 25. Make sure your player is registered and on our team rosters. It was a warm one– umbrellas made good for shade! 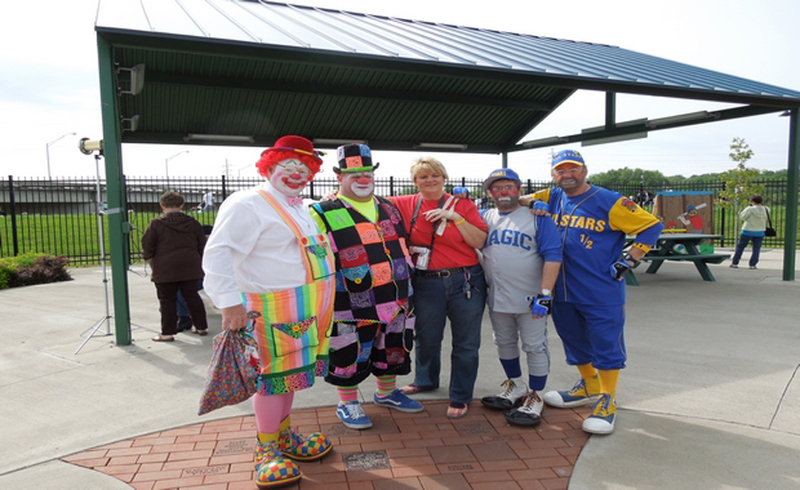 Thursday, September 13: We host the Ankeny Miracle League players for two ALL STAR Games, 6 & 7 PM. Please be sure to sign up to play and/or coach. Tuesday, September 18: It’s our Annual Des Moines Police & Fire Departments Night. DMPD & DMFD members make great buddies! Two ALL STAR Games, 6 & 7 PM. Please be sure to sign up to play and/or coach. Thursday, May 18 is The Iowa Barnstormers Night. Two games–6 and 7 PM. Pre-register at the player check-in tent. May 20 is picture day. Be sure to wear your uniforms for both team and individual pictures. Our “away” game night at the Ankeny Miracle League is Monday, May 22. Two games–6 and 7 PM. Pre-register at the player check-in tent. Friday, June 9 is Miracle League Night at The Iowa Barnstormers–for both the Kiwanis Miracle League and the Ankeny Miracle League. Game time 7:00 PM. Tickets $10@. Purchase at the player check-in tent. Our “magical night” with the DMPD and DMFD is Tuesday, June 13! Pre-register at the player check-in tent. Saturday, June 24 is DAIRY QUEEN DAY!